It took the AT&T Cotton Bowl Classic a while to get going Friday night but when it finally did, it turned into must-see TV. Especially for fans of the Missouri Tigers. A game that was slowed by a pair of scuffling offense through three quarters got going in the fourth quarter, with the teams combining for a Cotton Bowl record 41 points in the quarter as Missouri pulled away for a 41-31 victory over Oklahoma State. While the offenses scored in their typical video-game fashion for most of the quarter, it was a defensive play by the Tigers that secured the sixth-straight victory for the SEC in the Cotton Bowl. With Missouri clinging to a 34-31 lead and OSU driving in the game’s final minute, Michael Sam’s sack and forced fumble paved the way for Shane Ray’s 73-yard fumble return with 55 seconds remaining. The defensive TD put an end to a game that lasted more than four hours, featured 111 pass attempts and 117 plays. "It came down to the fourth quarter and we just got that fumble and he (Ray) ran down there," Missouri head coach Gary Pinkel said. "It was more about survival there towards the end but now I got that trophy. I’m going to have it forever." The defensive stop was much needed too. The quarter’s scoring started with an Oklahoma State field goal that tied the game at 17 with 13:32 remaining in the game. It turned out to be the first of seven scoring plays as Oklahoma State took its first lead of the game at 31-27 on Desmond Roland’s 2-yard run with 5:04 remaining. But Missouri quarterback James Franklin, who was ineffective for most of the game, led the Tigers on a 69-yard scoring drive to answer. Franklin, who was just 15 of 40 for 174 yards, found Dorial Green-Beckham for a 27-yard strike on 3rd and 10 at the OSU 43. Henry Josey scampered in from 16 yards out on the next play to put Missouri up for good. That put Oklahoma State on the offensive again and the Cowboys appeared to have the answer. The Cowboys moved from their 25 to the Missouri 26 before Sam, an All-America, made the play of the game. Chelf said he felt pressure and was trying to throw the ball away. 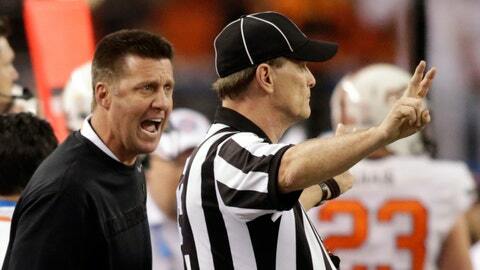 "They made the last couple of plays," Oklahoma State head coach Mike Gundy said. "It’s hard on our team. That’s a very, very disappointed locker room right now. Essentially we came up short the last two games of the year on what was basically the last play of the game." The Cowboys (10-3) lost the regular-season finale to Oklahoma State in the fourth quarter when a win would have secured them a BCS berth. Missouri (12-2) was also coming off a disappointing loss in the SEC Championship but came out with more life that the Cowboys Friday. Missouri led 14-7 in the second quarter after Maty Mauk came in for Franklin and led the Tigers on an 80-yard scoring drive. But both offenses went stagnant following that, with only three more points scored until late in the third quarter. Each team had three turnovers and a fourth for Missouri that was overturned proved to be pivotal. With the game tied at 24, Franklin was intercepted by OSU’s Tyler Patmon, who returned the pick for a 40-yard score. But Patmon was called for pass interference and Missouri turned the new life into a field goal. "I didn’t see it," Gundy said. "I just saw two guys competing for the ball. It’s really hard for me unless I see the replay of what happened. Both the receiver and the defender have the right for the ball." There was only one more turnover after that, and it was the clincher. Josey was named the game’s offensive most valuable player after running for 92 yards and three touchdowns. Chelf threw for 381 yards and two scores but was also intercepted twice. "We just battled offensively," Pinkel said. "We were having trouble all day with consistency of execution. We just kept battling at the very end and made some plays. Those two back-to-back drives, you never give up, you keep fighting." The Tigers, who were the last Big 12 team to win in the Cotton Bowl (in 2008), were pleased to pull out a victory for the SEC especially after Alabama was beaten by Oklahoma in a Big 12-SEC matchup Thursday night. "The SEC is such a powerful conference," said Josey, who scored on runs of 3, 25 and 16 yards. "That’s the conference that everybody looks to. That’s where all the attention is. Coming into this game that was in the back of our mind. That was always in the back of our mind that we had to hold up the rep for the SEC."